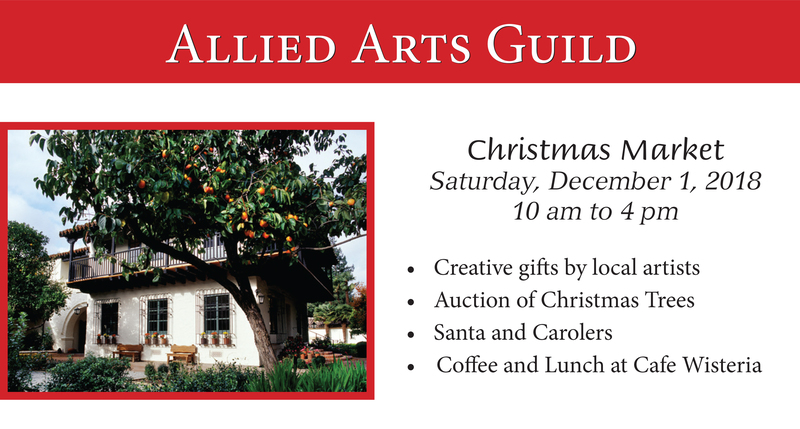 Join us at the Allied Arts Guild Auxiliary's Christmas Market! You'll find handcrafted goods from a variety of local vendors and artists, an auction of decorated and themed Christmas trees, and have the opportunity to enjoy carolers. Kids will have a chance to visit with Santa from noon-1 p.m. Finished your shopping? Come enjoy coffee or lunch at Café Wisteria. We hope to see you there! Free admission and parking. Proceeds benefit Lucile Packard Children’s Hospital Stanford.